This Federal Champion ammunition is a great all-round range and target load for 9mm Luger pistols of all kinds. Each cartridge in this case of 1,000 fires a light 115 grain full metal jacket bullet at a high muzzle velocity of 1,180 feet per second. This ammo delivers great accuracy and moderate recoil and uses a standard pressure powder charge suitable for subcompact and full-size pistols alike as well as older firearms. 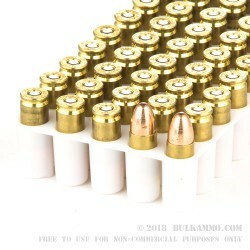 These cartridges are loaded at Federal's headquarters and main production facility in Anoka, Minnesota using reloadable brass cases and non-corrosive Boxer primers. Each case contains 20 boxes of 50 rounds each. Picked up 200 of Federal, had 23 Fail to eject or fully eject. May have just gotten a bad batch but that's my experience will not purchase Federal again. Shoots clean, accurate, and affordable. Shoots clean, accurate, and affordable. Federal Premium has never let me down. Shot half of my 1000rnd case so far and no failures in either my RIA GI FS 1911, or my S&W M&P9c. No acrid smell when shooting, guns barely needed cleaning after. Great groups out to 25 yds. These federal rounds are of outstanding quality. I have gone through all 1000 of the rounds I ordered. Not 1 fail to feed, fire, or eject. Every round went bang and the bore was no dirtier than it is with any other ammunition. I have nothing to do with Bulkammo.com and therefore have no incentive to give anything other than an genuine review. The product was first rate. Delivery was fast. You can look for better deals. I will buy the ammo while your looking. Outstanding deal, fast delivery and great quality! A: Hello Don, This ammunition is loaded with a lead core, copper jacketed projectile. This ammunition does not contain any steel. 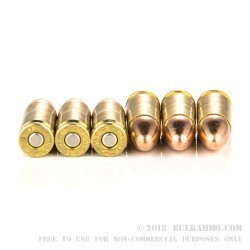 Q: How much is shipping for the 1000 round Federal 9mm bulk pack? It's probably posted somewhere, but I looked and looked but just could not find it. Posted On: 5/12/12 By: Chris S.
A: If you add the ammo to your cart, you will be able to put your zip code in the shipping calculator, which will tell you the costs. Q: just purchased a Ruger SR9c, is this a good load for target practice or would you recommend something else? A: Yes, this is a great choice for target practice with a Ruger SR9c. It's accurate, reliable, and affordable. You'll be able to practice more often, and the plated bullets reduce airborne lead exposure, especially at indoor ranges. Q: Is this new or remanufactured? I notice the price is lower than an equivalent quantity of remanufactured 9mm you have for sale. A: This Federal Champion ammo is new. It is manufactured to be competitive at a lower price point while still offering quality and performance. Q: What is the shelf life of this ammo? A: Unlike beans, rice, or wheat, ammo does not have a set shelf life. It can be reliable for decades if stored properly in a cool, dry place away from heat and water sources, or it can be made less effective in days or weeks by storing it in a damp place. Q: Do you have these in 124 grain? Also, do you have 124 grain hydro-shock JHP? A: We carry both Federal (American Eagle) 124gr FMJ and Federal HydraShok 124gr JHP. Q: Are this new or reloads? 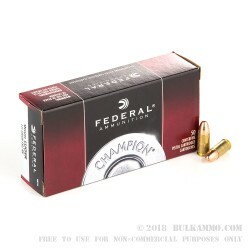 A: This Federal Champion 9mm ammo is factory new. Q: Would this run well in a Kel-Tec Sub 2000? Thanks! A: Yes, this Federal Champion ammo will work well in a Kel-Tec Sub 2000. Q: Will these "flat nose" rounds be just as good for target practice? A: Yes, these rounds will perform quite well for target practice purposes. Q: How does this brand rate against Magtech? A: Federal Ammunition is made in the United States and considered to be extremely high quality. Magtech is also high-quality ammunition. Both are good choices for general shooting. A: This Federal 9mm ammunition is loaded to SAAMI 9mm specifications; that is, it is not a +P load. Still, your Glock 17 should be able to fire a steady diet of +P ammunition. Q: What is the typical shelf life of this ammo if kept in a military, air tight ammo box? A: If stored properly, this 9mm ammo will maintain high reliability for decades. Q: Just purchased a new Ruger p95, is this a good load to break it in with? A: Yes, this Federal 9mm ammo will shoot very well in a Ruger P95. Q: How does the Federal Champion ammo differ from the American Eagle brand ammo from Federal? Same ammo different box? A: The major difference is that the Federal Champion ammo has plated bullets, while the American Eagle ammo has a traditional full metal jacket design. A: Federal ammo is regarded as some of the best, if not the absolute best, ammunition on the market. Federal is part of the ATK family of companies, which is contracted to operate the Lake City Army Ammunition Plant, and provides almost all of the ammunition loaded for use by the United States military. Federal also supplies a lot of the ammunition used by law enforcement agencies across the country. 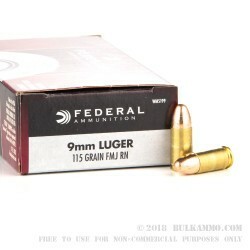 A: Yes, this Federal 9mm ammo is loaded with boxer-primed, brass cases, which are excellent for reloading. A: Thanks for pointing this out to us. This was a typo and we have changed the ammo overview to reflect "50 rounds per box, 20 boxes per case." There are 1,000 rounds of ammunition included in this case. Thanks again!